It was a bit of a gloomy weekend in Milwaukee, and I was pretty much down for that. To be honest, I actually like a rainy weekend as it lends itself to slowing down, being lazy, and well, cooking comforting food. As I was looking through my freezer on Saturday, I realized I had a nice chunk of corned beef that I had made a few weeks back. I immediately thought I would set it out and either make sandwiches during the football game the following day, or better yet, make an awesome corned beef hash the following morning. Then I pulled back on that thought and thought of making something other than that, and something that I think my wife would like to try. This is when I thought of a great Spanish dish tapa dish known as patatas bravas. If you have never heard of patatas brava, don’t worry. Patas bravas are one of Spain’s favorite tapas, or small snack like foods that are commonly served at a bar or restaurant. I knew this was the direction I wanted to go in, and they are so simple to make that anyone can make them. Don’t even get me started on the sauce that coats this potatoes. Start by adding water to a medium sized pot. Add about a tablespoon of salt, then add in the whole potatoes. Bring this to a medium-high heat, and cook for about 25 minutes, or just until the potatoes begin to soften. Drain the potatoes and set aside to let them cool. Once the potatoes have cooled, cut them in half, then cut the halves in half. Basically you are shooting for cutting them into about one inch cubes. During this time, make the sauce. To another pot, add the olive oil, and bring to a medium-high heat. Add in the garlic and shallot and let those begin to sweat for a few minutes, stirring along the way. Toss in the paprika, hot sauce, and tomato sauce. Give a good stir and let the sauce simmer for a few more minutes, then set aside to cool. Once the sauce has cooled a bit, add in the mayonnaise. Stir, then season with salt and pepper, to taste. Cover and place in the refrigerator until you are ready to use on the potatoes. Let’s just say the sauce is awesome, and you will want to start putting this on everything! Heat a cup of canola oil on medium-high heat in a pot, or large skillet. After a few minutes, add in the chopped potatoes, and cook them, stirring along the way, until they are golden brown, and crisp. Remove them from the oil with a slotted spoon and let them drain on a plate lined with paper towel. Season the potatoes with salt and pepper. 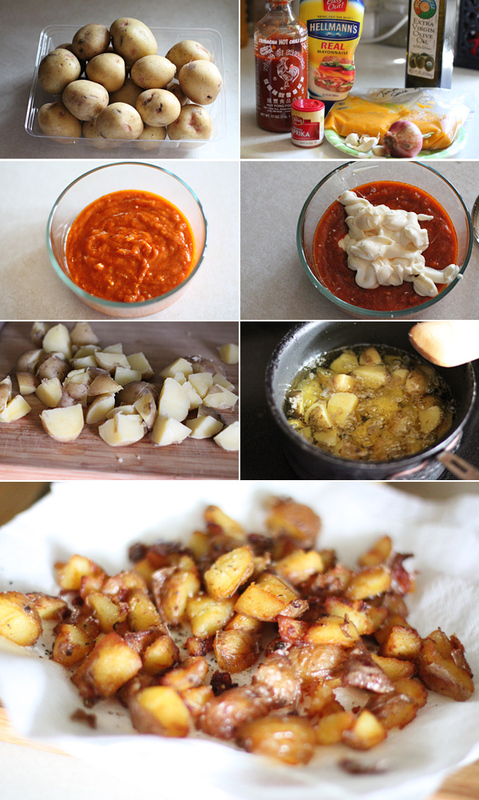 Place the potatoes onto your serving dish, then drizzle the sauce all over the potatoes. Now, dig in! 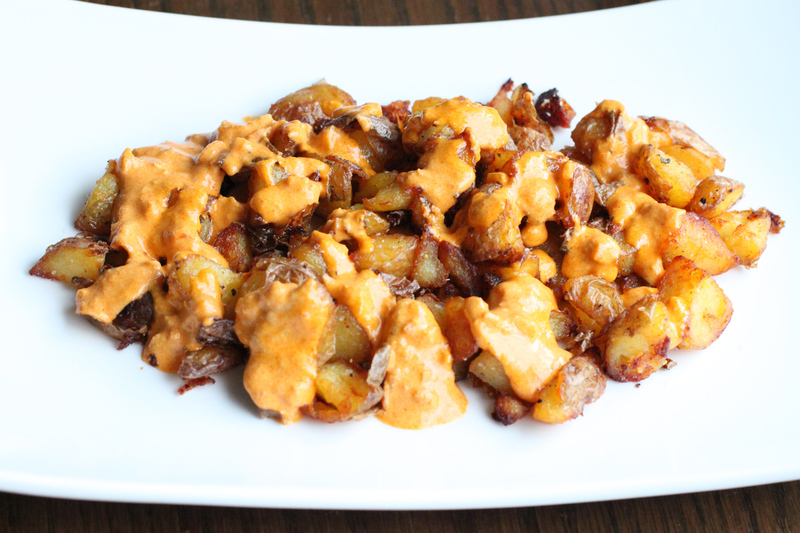 These patatas bravas are really, really awesome. I’m not kidding when I tell you this. They are perfectly crisp on the outside, and nice and tender on the inside, and when biting into them you get this wonderful bite from the sauce that is perfectly balanced by the mayonnaise. 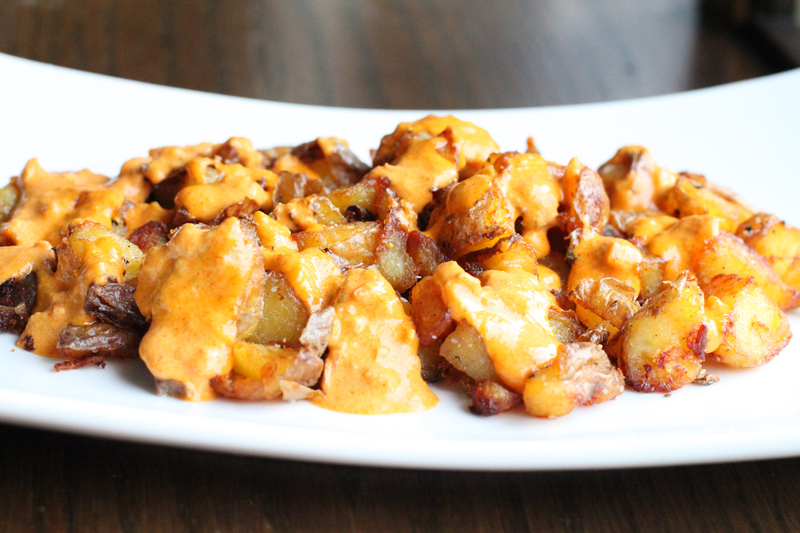 Mayonnaise and potatoes might just be your new best friend. Hope you enjoy!